Located on the mountain just a few minutes from the ski trails Chalet Beliza is a spectacular luxury retreat that combines mountain elegance and modern design. This 4,754 square foot is an ideal home base for families seeking convenience and comfort within easy reach of everything. From the comfort of the living room, panoramic views and sunsets of the Emerald Mountain can be enjoyed while staying toasty-warm in front of the double-sided gas fireplace. The open, gourmet kitchen has professional grade appliances including double Wolf ovens, Wolf gas range, an extra sink and two dishwashers with island seating for four on comfortable leather barstools. This compliments the seating for eight at the dining room table just in front of the other side of the fireplace. A half bath and large laundry room are also conveniently located on the main floor. The upper level Master Suite includes a King bed, fireplace lounge, a 40in LCD TV, Blu-Ray DVD player, walk-in closet and private en-suite bath complete with soaking tubs, steam shower, dual vanities, water closet, and heated tile floors. 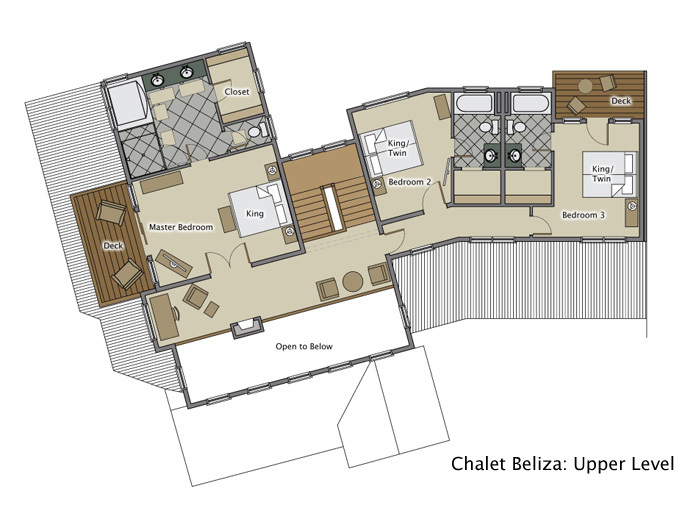 Also on the upper level is a second bedroom with the option of a King or two Twin beds and private bathroom. On the main level is another room with the option of a King or two Twin beds and private bathroom. On the lower level, there is ample space for recreating and relaxing as well as two more bedrooms- one with a king or two Twin beds, and the other with King bunks and ensuite bathrooms. All bedrooms come complete with designer bedding including 600 thread-count sheets and plush cotton towels and robes. The lower level recreation room has plenty of seating, a card table, large bar, Sony Playstation 3, queen sleeper sofa, half bath, and walkout to the covered hot tub equipped with built-in radio. Ski access to the world famous Steamboat Springs Ski area is easy by private shuttle that will collect you from the door and deliver you in a couple of minutes to begin your day on the mountain. 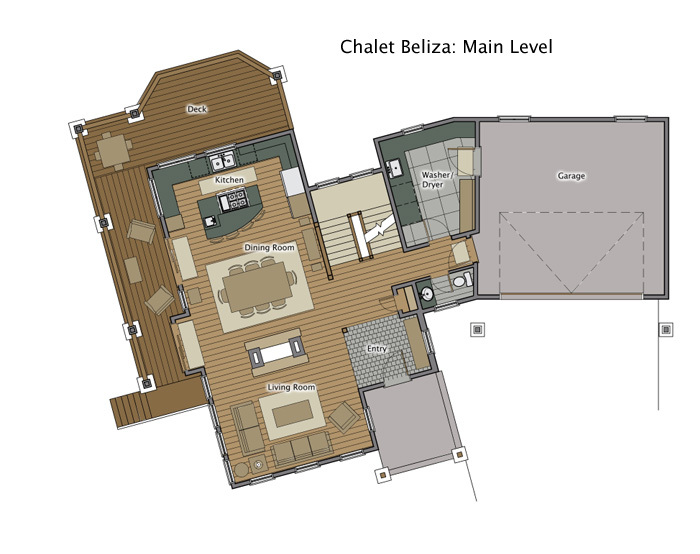 We had a wonderful time at Chalet Beliza. The house was equipped with everything we needed! It felt luxurious, but was friendly enough for a toddler and baby. Kitchen was beautiful! The property management company also did a wonderful job. We took the free, private shuttle everywhere. Will definitely be back next year!